Storyline: It’s spring cleaning at the farm. After scrubbing clean his horses, ducks, cows, dogs, goats and other animals and birds on Farmer’s yard, all was left, were the hogs. So Farmer took his pail and soap and headed to the pigs’ pen. Except that the pigs didn’t want a scrub. They were happy as they were, just rolling in the mud. So they put up a sign “No hogwash for us today. Pigs love dirt – so go away”. But Farmer wasn’t going to give up. If the pigs didn’t want the bath, maybe they’ll take a shower. He took a hose and sprayed the pigs. But all he accomplished was to make more mud for the hogs. Other methods of tricking them into taking that bath also failed. Then Farmer cooked up a really sneaky way to accomplish the hogwash: he loaded water and soap into his crop dust plane and took off. His plan was to spray the soapy water over pigs from his plane, from high above. He boarded the plane, sat on the pilot’s seat and took off. But as he flew over the hogs’ pen, the plane run out of gas. And Farmer and his machine crashed on the pen, in the mud. Laying down, perhaps feeling defeated, Farmer realizes that being in the mud is not so bad. Actually, it looked like he enjoyed it, because he called for all the animals in the farm to join him in the mud pen. From then on, he made a habit of taking a mud bath every day. The End. This Karma Wilson book is in rhymes. 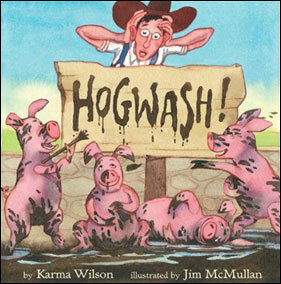 Hogwash is a children book that has a lesson for big and small alike. Sometimes it takes a lot of work to realize that your ideas are not suited for everybody. That’s what Farmer learns. Eventually, he ends up abandoning his idea of changing the hogs’ way of life and more, taking part on it. Illustration: Jim McMullan, is an award-winning illustrator, has done the art on this book. The illustration, in watercolor, is minimal but to the point. The paintings fill each page with the text, set up in a corner or at the bottom. There are only enough details as to make it significant. The colors are mainly pink, brown, blue and green. I mainly like the Farmer who has a skinny figure but a very expressive face.